The following article by Jon Tevlin has been published in the August 10, 2014 issue of the StarTribune. Ryan Companies proposes a $400 million redevelopment of five blocks now dominated by surface parking lots between the downtown central business district and the new Vikings stadium. In June, the Trust for Public Land declared that Minneapolis and the Twin Cities had the best public parks in the country. Better than New York. Better than Boston. Better than Sacramento, Calif.
Then, earlier this week, the Metropolitan Council said the metro’s parks attracted 47 million visitors in 2013, an increase of 3 percent from the previous year. We love our parks. Finally, on Wednesday, the Minneapolis Park Board got together to decide whether they wanted to take on the city’s newest and perhaps most visible park project, a sweet piece of land smack dab in downtown, adjacent to the new Vikings stadium and the eventual towers for Wells Fargo. It could be the crown jewel of parks, an oasis between the river and Loring Park. The Park Board responded: “It ain’t a park, and it certainly isn’t public,” said Commissioner Anita Tabb in rejecting control of the space. I can’t really blame them. The idea for what’s now called “the Yard” was developed backward, a nibble of dessert after the public was force fed the cost of the stadium first. The Park Board is already financially pinched, and it is rightly suspicious of having to foot the bill for what could be an expensive little bauble that will mostly serve those attending sporting events or corporate shindigs. The afternoon before the Park Board meeting, I talked to David C. Smith for some historical perspective on the Yard. He wrote a book on the Minneapolis park system for the Foundation for Minneapolis Parks in 2007. The way the Yard is developing, it could be a disaster for downtown and the city, Smith warns. The biggest land-use mistakes in the city’s history, Smith said, came from trying to fashion parks to be something other than what parks are supposed to be: places to visit, relax and enjoy recreation or entertainment. “There has to be a reason for people to go there,” Smith said in an interview. Smith cited the High Line park in New York and Chicago’s Millennium Park as examples of successful urban parks. The fact that the park sits adjacent to another huge attraction, the Art Institute of Chicago, doesn’t hurt. The constraints put on the land use by the Vikings and Minnesota Sports Facilities Authority, which would tie up the park for up to 80 prime days per year, “make it impossible for landscape architects. How do you design a space that has to be knockdown able” for corporate tents during events? One was the Gateway, in 1913, at the then-junction of Hennepin and Nicollet Avenues. It was created to be a gateway from the railroad station into downtown, not as a park that would naturally draw people to it. Well, except lumbermen, “the unemployed, indigent and inebriated,” Smith wrote. He’s quick to point out he’s all for facilities for homeless people, but argues a failed park is not the way to accomplish that. The Park Board ended up spending more than 5 percent of its entire budget on the Gateway, mostly for police and cleanup. Sound like a blueprint for the Yard? Even park pioneer Charles Loring predicted Gateway Park would fail, and it did. But that didn’t stop the city from pushing another downtown green space, Pioneer Square, to act as a sort of decorative attachment to the post office. By 1953, Smith said, cleaning crews picked up 70 bushels of empty wine and whiskey bottles from Gateway, and 53 bushels from Pioneer Square. “Further proof that you can’t just plop green space down in a city and expect it to serve some vague ‘beautifying’ or ‘park’ purpose — even with some dressing up,” Smith writes. Smith was hoping the Park Board would take on the Yard (which he thinks being adjacent to the jail makes people think of a prison yard) because “they’ve done a pretty good job for 130 years,” but also because there would be some elected accountability. “I wish those foundations and wealthy individuals would step up and give money to the Park Board,” Smith said. He realizes, however, those entities are no longer interested in giving up control to a public body. Second best would be a conservancy supported by those who will benefit, such as the Vikings, Wells Fargo and surrounding businesses. “If you want a public park down here, you have to give careful consideration on how you do everything,” Smith said. 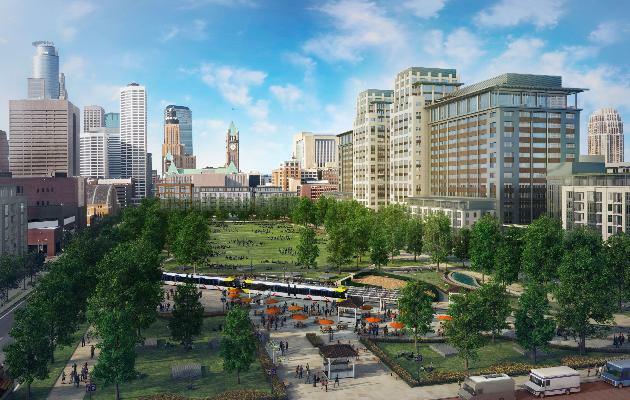 Otherwise, Minneapolis is looking at another Gateway Park or Pioneer Square.